Athletic foot injuries can be difficult to properly diagnose and treat. Bearing the weight of the entire body, the foot is under tremendous stress. In many sports, the foot absorbs tremendous shearing and loading forces, sometimes reaching over 20 times the person's body weight. Physicians who treat these disorders must have a good understanding of the anatomy and kinesiology of the foot. Select bones of the foot (dorsal and plantar views). Select bones of the foot (superolateral view). Physicians who evaluate and treat common foot problems should have a working knowledge of the individual sports and the injuries that are commonly associated with them. An understanding of the basic treatment approaches for these injuries also is imperative. For excellent patient education resources, visit eMedicineHealth's First Aid and Injuries Center. Also, see eMedicineHealth's patient education articles Broken Foot and Broken Toe. Estimates indicate that 15% of sports-related injuries affect the foot alone. 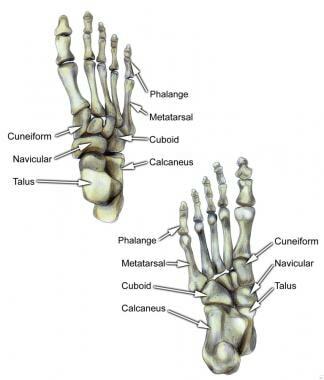 The foot is composed of 26 major bones, which can be divided into 3 regions: the forefoot, midfoot, and hindfoot. The forefoot is comprised of the 5 metatarsals and the 14 phalanges. The 3 cuneiforms (ie, lateral, intermediate, medial), the cuboid, and the navicular represent the midfoot. The hindfoot is composed of the talus and the calcaneus (see image below). The hindfoot is composed of the talus and the calcaneus. The talus is oriented to transmit forces from the foot through the ankle to the leg. The calcaneus is the largest bone in the foot. The Achilles tendon inserts on the posterior aspect of the calcaneus. The navicular lies anterior to the talus and medial to the cuboid. 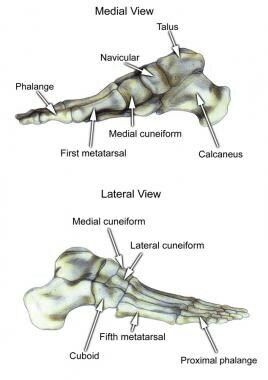 The cuboid articulates with the calcaneus proximally, with the fourth and fifth metatarsals distally, and with the lateral cuneiform medially (see image below). Select bones of the foot (medial and lateral views). Each of the cuneiform bones is wedge-shaped. 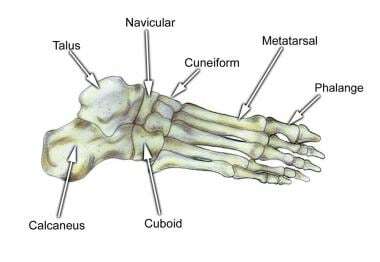 The medial, intermediate, and lateral cuneiform bones articulate with the first 3 metatarsals distally and the navicular proximally. The cuboid articulates with the lateral cuneiform. The 5 metatarsals articulate with the proximal phalanges. The great toe is composed of 2 phalanges, with 3 for each lesser toe. Although variation exists in the number and location of the sesamoid bones, 2 constant sesamoids are present beneath the metatarsal head. 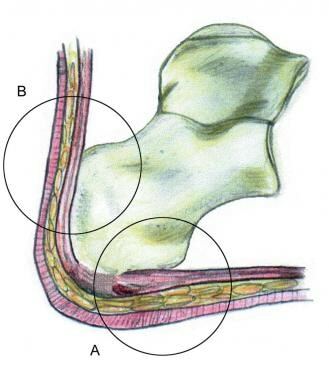 The sesamoids are usually present within tendons juxtaposed to articulations. Select tendons of the foot. The flexor hallucis longus (FHL) tendon is 1 of 3 structures that lie in the tarsal tunnel. Running behind the medial malleolus, the FHL is the most posterolateral. The FHL runs anterior to insert onto the distal phalanx of the great toe. The FHL acts as a flexor of the great toe, elevates the arch, and assists with plantar flexion of the ankle. 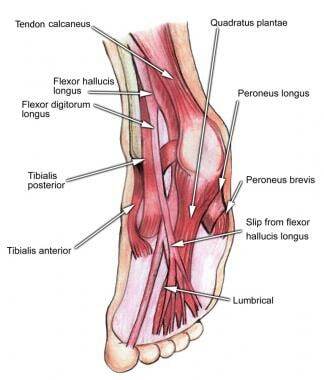 The flexor digitorum longus (FDL) tendon passes between the FHL and tibialis posterior tendon. The FDL inserts onto the distal phalanges of the 4 lateral digits and acts to flex the distal phalanges. The tibialis posterior tendon is the most anteromedial of the tarsal tunnel tendons. This tendon inserts on the navicular tuberosity; the 3 cuneiforms; the cuboid; and the second, third, and fourth metatarsals. The tibialis posterior muscle flexes, inverts, and adducts the foot. Laterally, the peroneus longus and peroneus brevis tendons share the common peroneal tunnel running behind and around the lateral malleolus. The peroneus longus plantar flexes the first metatarsal, flexes the ankle, and abducts the foot. The peroneus brevis flexes the ankle and everts the foot. The plantar aponeurosis or fascia is a deep span of connective tissue extending from the anteromedial tubercle of the calcaneus to the proximal phalanges of each of the toes. Medial and lateral fibrous septa originate from the medial and lateral borders to attach to the first and fifth metatarsal bones. Nerve innervation of the foot runs along the medial and lateral metatarsals and phalanges in a neurovascular bundle. These nerves are vulnerable to compressive forces that, in time, can generate the painful Morton neuroma, which most commonly affects the interspace between the third and fourth metatarsals. Four nerves supply the forefoot: the sural nerve (most lateral), branches of the superficial peroneal nerve, the deep peroneal nerve, and the saphenous nerve. The joint between the forefoot and the midfoot, the tarsometatarsal (TMT) joint or Lisfranc joint, is formed by a mortise of the cuneiform bones surrounding the base of the second metatarsal. This joint is supported by the transverse ligaments, and the Lisfranc ligament joins the medial cuneiform and the base of the second metatarsal. Disruption of this ligament can result in a destabilization of the TMT joint complex of the foot, the result of which can be instability of the arch and the midfoot. The 3 planes in which the foot and ankle function are the transverse, sagittal, and frontal. Movement is possible in all 3 planes. Plantar flexion and dorsiflexion occur in the sagittal plane. Plantar flexion involves the foot moving from the anterior leg distally. Dorsiflexion is the opposite motion. Inversion and eversion occur in the frontal plane of motion. Eversion occurs when the bottom of the foot turns away from the midline of the body. Inversion is the opposite action. The 2 transverse plane motions are abduction and adduction. Adduction involves the foot moving toward the midline of the body, whereas abduction is the opposite action. Malanga GA, Ramirez-Del Toro JA. Common injuries of the foot and ankle in the child and adolescent athlete. Phys Med Rehabil Clin N Am. 2008 May. 19(2):347-71, ix. [Medline]. Birrer RB, Dellacorte MP, Grisafi PJ. Common Foot Problems in Primary Care. 2nd ed. Philadelphia, Pa: Hanley & Belfus Inc; 1998. Sammarco GJ, Cooper PS. Foot and Ankle Manual. 2nd ed. Philadelphia, Pa: Lippincott Williams & Wilkins; 1998. Scurran BL. Foot and Ankle Trauma. 2nd ed. New York, NY: Churchill Livingstone; 1996. Cailliet R. Foot and Ankle Pain. 3rd ed. Philadelphia, Pa: FA Davis Co; 1997. Weinfeld SB, Haddad SL, Myerson MS. Metatarsal stress fractures. Clin Sports Med. 1997 Apr. 16(2):319-38. [Medline]. Knapp TP, Garrett WE Jr. Stress fractures: general concepts. Clin Sports Med. 1997 Apr. 16(2):339-56. [Medline]. DeLee JC, Evans JP, Julian J. Stress fracture of the fifth metatarsal. Am J Sports Med. 1983 Sep-Oct. 11(5):349-53. [Medline]. Maitra RS, Johnson DL. Stress fractures. Clinical history and physical examination. Clin Sports Med. 1997 Apr. 16(2):259-74. [Medline]. Ebell MH. Evaluating the patient with an ankle or foot injury. Am Fam Physician. 2004 Oct 15. 70(8):1535-6. [Medline]. [Full Text]. Stiell IG, Greenberg GH, McKnight RD, et al. Decision rules for the use of radiography in acute ankle injuries. Refinement and prospective validation. JAMA. 1993 Mar 3. 269(9):1127-32. [Medline]. Smith K, Waldrop N. Operative Outcomes of Grade 3 Turf Toe Injuries in Competitive Football Players. Foot Ankle Int. 2018 Sep. 39 (9):1076-1081. [Medline]. Richardson DR, Dean EM. The recurrent Morton neuroma: what now?. Foot Ankle Clin. 2014 Sep. 19 (3):437-49. [Medline]. Simon RR, Koenigsknecht SJ. Tarsometatarsal fracture-dislocations. Emergency Orthopedics: The Extremities. 3rd ed. Norwalk, Conn: Appleton & Lange; 1995. 331-2. Hesp WL, van der Werken C, Goris RJ. Lisfranc dislocations: fractures and/or dislocations through the tarso-metatarsal joints. Injury. 1984 Jan. 15(4):261-6. [Medline]. Lenczner EM, Waddell JP, Graham JD. Tarsal-metatarsal (Lisfranc) dislocation. J Trauma. 1974 Dec. 14(12):1012-20. [Medline]. Germann CA, Perron AD, Miller MD, Powell SM, Brady WJ. Orthopedic pitfalls in the ED: calcaneal fractures. Am J Emerg Med. 2004 Nov. 22(7):607-11. [Medline]. Griffin D, Parsons N, Shaw E, Kulikov Y, Hutchinson C, Thorogood M, et al. Operative versus non-operative treatment for closed, displaced, intra-articular fractures of the calcaneus: randomised controlled trial. BMJ. 2014 Jul 24. 349:g4483. [Medline]. Hsu AR. Topical review: barefoot running. Foot Ankle Int. 2012 Sep. 33(9):787-94. [Medline]. Lieberman DE. What we can learn about running from barefoot running: an evolutionary medical perspective. Exerc Sport Sci Rev. 2012 Apr. 40(2):63-72. [Medline]. Rixe JA, Gallo RA, Silvis ML. The barefoot debate: can minimalist shoes reduce running-related injuries?. Curr Sports Med Rep. 2012 May-Jun. 11(3):160-5. [Medline]. Altman AR, Davis IS. Barefoot running: biomechanics and implications for running injuries. Curr Sports Med Rep. 2012 Sep-Oct. 11(5):244-50. [Medline]. Conti SF. Posterior tibial tendon problems in athletes. Orthop Clin North Am. 1994 Jan. 25(1):109-21. [Medline]. Gellman R, Burns S. Walking aches and running pains. Injuries of the foot and ankle. Prim Care. 1996 Jun. 23(2):263-80. [Medline]. Gilman AG, Rall TW, Nies AS, Taylor P, eds. Goodman and Gilman's the Pharmacological Basis of Therapeutics. 8th ed. New York, NY: McGraw Hill Inc; 1993. 489-500, 664-667. Haverstock BD. Foot and ankle imaging in the athlete. Clin Podiatr Med Surg. 2008 Apr. 25(2):249-62, vi-vii. [Medline]. Jenkins WL, Raedeke SG, Williams DS 3rd. The relationship between the use of foot orthoses and knee ligament injury in female collegiate basketball players. J Am Podiatr Med Assoc. 2008 May-Jun. 98(3):207-11. [Medline]. Nunan PJ, Giesy BD. Management of Morton's neuroma in athletes. Clin Podiatr Med Surg. 1997 Jul. 14(3):489-501. [Medline]. Sherman KP. The foot in sport. Br J Sports Med. 1999 Feb. 33(1):6-13. [Medline]. [Full Text]. Sims EL, Hardaker WM, Queen RM. Gender differences in plantar loading during three soccer-specific tasks. Br J Sports Med. 2008 Apr. 42(4):272-7. [Medline]. Wedmore IS, Charette J. Emergency department evaluation and treatment of ankle and foot injuries. Emerg Med Clin North Am. 2000 Feb. 18(1):85-113, vi. [Medline]. Wu KK. Morton neuroma and metatarsalgia. Curr Opin Rheumatol. 2000 Mar. 12(2):131-42. [Medline].